Written with the possibility of romantic relationships in mind, this product contains answers to the problem of lonely adventurers, and more. Should you have a character who is looking for a little romance, now you have a resource to help you get started, complete with statistics for the Pathfinder Roleplaying Game. However, tender moments are not the only use for these NPCs. These fully-detailed characters can be used as anything from bit players to members of an adventuring party to major personages in your campaign. As always we have taken care that the descriptions can be used to enhance most fantasy settings and fit into your existing campaign or situation as easily as possible. The Pathfinder Roleplaying Game statistics are offered for your convenience, but the characters are well-enough developed that you could use them in other game systems, because they don’t depend on their stats to be interesting. With cover artwork by Brenna Alyn Walters, interior art by Rob Hughes and character depictions by Gillian Pearce and Marina Badani (among others), Shards of the Heart (PFRPG) offers plenty of visual stimulation to get your creativity flowing. 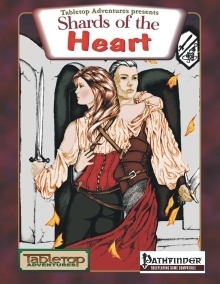 Shards of the Heart (PFRPG) is available at RPGNow.com.